Turneriella parva Levett et al. 2005 is the only species of the genus Turneriella which was established as a result of the reclassification of Leptospira parva Hovind-Hougen et al. 1982. Together with Leptonema and Leptospira, Turneriella constitutes the family Leptospiraceae, within the order Spirochaetales. Here we describe the features of this free-living aerobic spirochete together with the complete genome sequence and annotation. This is the first complete genome sequence of a member of the genus Turneriella and the 13th member of the family Leptospiraceae for which a complete or draft genome sequence is now available. The 4,409,302 bp long genome with its 4,169 protein-coding and 45 RNA genes is part of the Genomic Encyclopedia of Bacteria and Archaea project. Strain HT (= DSM 21527 = NCTC 11395 = ATCC BAA-1111) is the type strain of Turneriella parva . 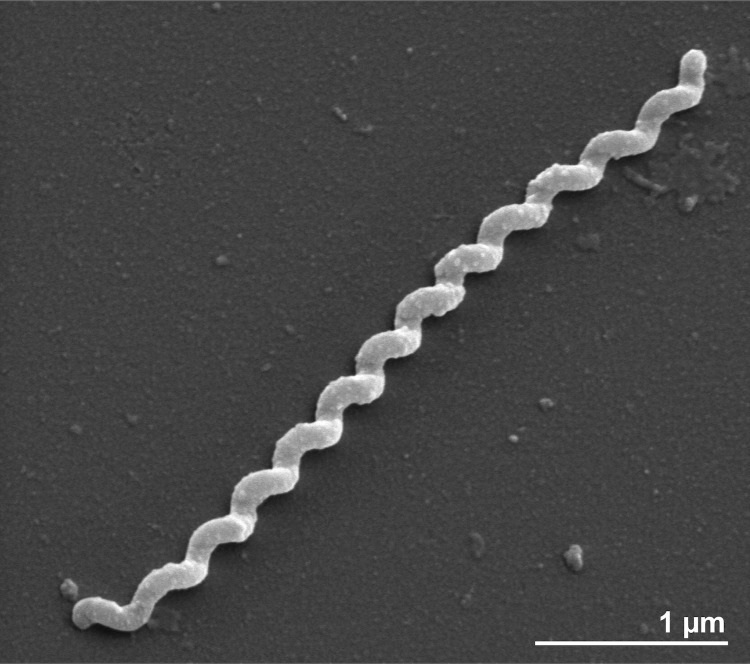 The strain was isolated from contaminated Leptospira culture medium  and was originally thought to be affiliated with Leptospira  because of morphological similarities to other members of the genus. Strain HT was designated as a separate species because of certain morphological and molecular differences: cells were shorter and were more tightly wound, the surface layer formed blebs instead of cross-striated tubules when detached for negative staining preparation and the base composition of DNA differed from that of other Leptospira species . DNA-DNA hybridization  and enzyme activity  studies revealed sufficient differences between other Leptospira species and L. parva that the ‘Subcommittee on the Taxonomy of Leptospira’  decided to exclude L. parva from the genus Leptospira and assign it as the type strain of a new genus: ‘Turneria’ as ‘Turneria parva’. The genus was named in honor of Leslie Turner, an English microbiologist who made definitive contributions to the knowledge of leptospirosis . However, as the generic name is also in use in botany and zoology, this name was rendered illegitimate and invalidate, but was used in the literature [6,7]. The first 16S rRNA gene-based study (Genbank accession number Z21636), performed on Leptospira parva incertae sedis, confirmed the isolated position of L. parva among Leptonema and Leptospira species , a finding later supported by Morey et al. . The reclassification of L. parva as Turneriella parva com. nov. was published by Levett et al. , reconfirming the separate position of the type strain  and an additional strain (S-308-81, ATCC BAA-1112) from the uterus of a sow from all other leptospiras on the basis of DNA-DNA hybridization and 16S rRNA gene sequence analysis (Genbank accession number AY293856). The strain was selected for genome sequencing because of its deep branching point within the Leptospiraceae lineage. Here we present a summary classification and a set of features for T. parva HT together with the description of the complete genomic sequencing and annotation. A representative genomic 16S rDNA sequence of T. parva HT was compared using NCBI BLAST [11,12] under default settings (e.g., considering only the high-scoring segment pairs (HSPs) from the best 250 hits) with the most recent release of the Greengenes database  and the relative frequencies of taxa and keywords (reduced to their stem ) were determined, weighted by BLAST scores. The most frequently occurring genera were Geobacter (48.7%), Leptospira (19.2%), Pelobacter (13.4%), Spirochaeta (8.1%) and Turneriella (6.4%) (56 hits in total). Regarding the single hit to sequences from members of the species, the average identity within HSPs was 95.8%, whereas the average coverage by HSPs was 89.8%. Among all other species, the one yielding the highest score was Leptonema illini (AY714984), which corresponded to an identity of 85.7% and an HSP coverage of 62.6%. (Note that the Greengenes database uses the INSDC (= EMBL/NCBI/DDBJ) annotation, which is not an authoritative source for nomenclature or classification.) The highest-scoring environmental sequence was DQ017943 (Greengenes short name 'Cntrl Erpn Rnnng Wtrs Exmnd TGGE and uplnd strm cln S-BQ2 83'), which showed an identity of 95.6% and an HSP coverage of 97.8%. The most frequently occurring keywords within the labels of all environmental samples which yielded hits were 'microbi' (5.5%), 'sediment' (2.6%), 'soil' (2.5%), 'industri' (2.1%) and 'anaerob' (1.9%) (194 hits in total). Environmental samples which yielded hits of a higher score than the highest scoring species were not found. Figure 1 shows the phylogenetic neighborhood of T. parva HT in a 16S rRNA based tree. The sequences of the two identical 16S rRNA gene copies in the genome do not differ from the previously published 16S rRNA sequence (AY293856). Phylogenetic tree highlighting the position of T. parva relative to the type strains of the other species within the phylum 'Spirochaetes'. The tree was inferred from 1,318 aligned characters [15,16] of the 16S rRNA gene sequence under the maximum likelihood (ML) criterion . Rooting was done initially using the midpoint method  and then checked for its agreement with the current classification (Table 1). The branches are scaled in terms of the expected number of substitutions per site. Numbers adjacent to the branches are support values from 500 ML bootstrap replicates  (left) and from 1,000 maximum-parsimony bootstrap replicates  (right) if larger than 60%. Lineages with type strain genome sequencing projects registered in GOLD  are labeled with one asterisk, those also listed as 'Complete and Published' with two asterisks [22-28]; for Sphaerochaeta pleomorpha see CP003155. The collapsed Treponema subtree contains three species formerly assigned to Spirochaeta that have recently been included in the genus Treponema, even though those names are not yet validly published . Classification and general features of T. parva HT according to the MIGS recommendations . Cells of strain HT are Gram-negative, flexible and helical with 0.3 µm in diameter and 3.5-7.5 µm in length and a wavelength of 0.3-0.5 µm (Figure 2). Motility is achieved by means of two axial filaments, similar to those of other leptospiras. The surface of the cells show several blebs with no apparent substructure when prepared for negative staining while under the same conditions, cross-striated tubules are visible in other leptospiras [1,2]. The strain is obligately aerobic and oxidase positive. Slow and limited growth occurs in polysorbate albumin medium  at 11, 30 and 37 °C. Growth is inhibited by 8-azaguanine (200 µg ml-1) and 2,6 diaminopurine (µg ml-1). Lipase is produced, long-chain fatty acids and long-chain fatty alcohols are utilized as carbon and energy sources. L-lysine arylamidase, α-L-glutamate arylamidase, glycine arylamidase, leucyl-glycine arylamidase and α-D-galactosidase activities are lacking . The type strain is not pathogenic for hamsters . Information on peptidoglycan composition, major cell wall sugars, fatty acids, menaquinones and polar lipids is not available. The mol% G+C of DNA was originally reported to be approximately 48% , significantly less than the G+C content inferred from the genome sequence. T. parva strain HT, DSM 21527, was grown in semisolid DSMZ medium 1113 (Leptospira medium)  at 30°C. DNA was isolated from 1-1.5 g of cell paste using MasterPure Gram-positive DNA purification kit (Epicentre MGP04100) following the standard protocol as recommended by the manufacturer with modification st/DL for cell lysis as described in Wu et al. 2009 . DNA is available through the DNA Bank Network . The genome was sequenced using a combination of Illumina and 454 sequencing platforms. All general aspects of library construction and sequencing can be found at the JGI website . Pyrosequencing reads were assembled using the Newbler assembler (Roche). The initial Newbler assembly consisting of 217 contigs in 1 scaffold was converted into a phrap  assembly by making fake reads from the consensus, to collect the read pairs in the 454 paired end library. Illumina GAii sequencing data (8,018.4 Mb) was assembled with Velvet  and the consensus sequences were shredded into 1.5 kb overlapped fake reads (shreds) and assembled together with the 454 data. The 454 draft assembly was based on 200.6 Mb 454 draft data and all of the 454 paired end data. Newbler parameters are -consed -a 50 -l 350 -g -m -ml 21. The Phred/Phrap/Consed software package  was used for sequence assembly and quality assessment in the subsequent finishing process. After the shotgun stage, reads were assembled with parallel phrap (High Performance Software, LLC). Possible mis-assemblies were corrected with gapResolution , Dupfinisher , or sequencing cloned bridging PCR fragments with subcloning. Gaps between contigs were closed by editing in Consed, by PCR and by Bubble PCR primer walks (J.-F. Chang, unpublished). A total of 361 additional reactions and 11 shatter library were necessary to close some gaps and to raise the quality of the final contigs. Illumina reads were also used to correct potential base errors and increase consensus quality using a software Polisher developed at JGI . The error rate of the final genome sequence is less than 1 in 100,000. Together, the combination of the Illumina and 454 sequencing platforms provided 1,722.1 × coverage of the genome. The final assembly contained 348,698 pyrosequence and 97,925,368 Illumina reads. Genes were identified using Prodigal  as part of the DOE-JGI annotation pipeline , followed by a round of manual curation using the JGI GenePRIMP pipeline . The predicted CDSs were translated and used to search the National Center for Biotechnology Information (NCBI) nonredundant database, UniProt, TIGR-Fam, Pfam, PRIAM, KEGG, COG, and InterPro databases. Additional gene prediction analysis and functional annotation was performed within the Integrated Microbial Genomes - Expert Review (IMG-ER) platform . The genome statistics are provided in Table 3 and Figure 3. The genome in its current assembly consists of two linear scaffolds with a total length of 4,384,015 bp and 25,287 bp, respectively, and a G+C content of 53.6%. Of the 4,214 genes predicted, 4,169 were protein-coding genes, and 45 RNAs; 30 pseudogenes were also identified. The majority of the protein-coding genes (57.9%) were assigned a putative function while the remaining ones were annotated as hypothetical proteins. The distribution of genes into COGs functional categories is presented in Table 4. Graphical map of the largest scaffold (smaller scaffold not shown). From bottom to the top: Genes on forward strand (color by COG categories), Genes on reverse strand (color by COG categories), RNA genes (tRNAs green, rRNAs red, other RNAs black), GC content, GC skew (purple/olive). The description of the species Turneriella parva is the one given by Levett et al. 2005 , with the following modification: DNA G+C content is 53.6 mol%. We would like to gratefully acknowledge the help of Sabine Welnitz for growing T. parva cultures, and Evelyne-Marie Brambilla for DNA extraction and quality control (both at DSMZ). This work was performed under the auspices of the US Department of Energy Office of Science, Biological and Environmental Research Program, and by the University of California, Lawrence Berkeley National Laboratory under contract No. DE-AC02-05CH11231, Lawrence Livermore National Laboratory under Contract No. DE-AC52-07NA27344, and Los Alamos National Laboratory under contract No. DE-AC02-06NA25396, UT-Battelle and Oak Ridge National Laboratory under contract DE-AC05-00OR22725. Picardeau M, Bulach DM, Bouchier C, Zuerner RL, Zidane N, Wilson PJ, Creno S, Kuczek ES, Bommezzadri S, Davis JC, et al. 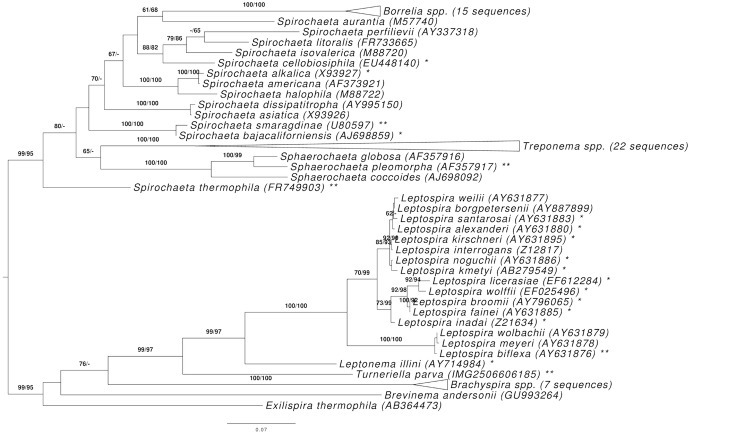 Genome sequence of the saprophyte Leptospira biflexa provides insights into the evolution of Leptospira and the pathogenesis of leptospirosis. PLoS ONE 2009; 13:e1607. Sulzer CR, Jones WL. Leptospirosis, methods in laboratory diagnosis, revised ed. Centers for Disease Control publication 80-8275. 1980; Centers for Disease Control, Atlanta. Han C, Chain P. Finishing repeat regions automatically with Dupfinisher. In: Proceeding of the 2006 international conference on bioinformatics & computational biology. Arabnia HR, Valafar H (eds), CSREA Press. June 26-29, 2006:141-146.